Pop in and say hello, or come back later and enjoy the webinar archive. Earlier this year, Desmos unleashed its table feature, and it is a seamless addition to an already simple tool. You have choices for how to implement a table in a Desmos document. Start a new table, and enter a rule in the “y” position. Or take an existing function, and “edit” it to become a table. Or, name your function as f(x) and Desmos will recognize it in a new table. Here, a quadratic function was converted to a table, and a new column added to compute values of the derivative. Think about the conversations you can with your class about this. How do the values of the rule “2x+4” relate to the graph of the quadraic function? When does 2x+4 take on positive / negative value? When is it zero? 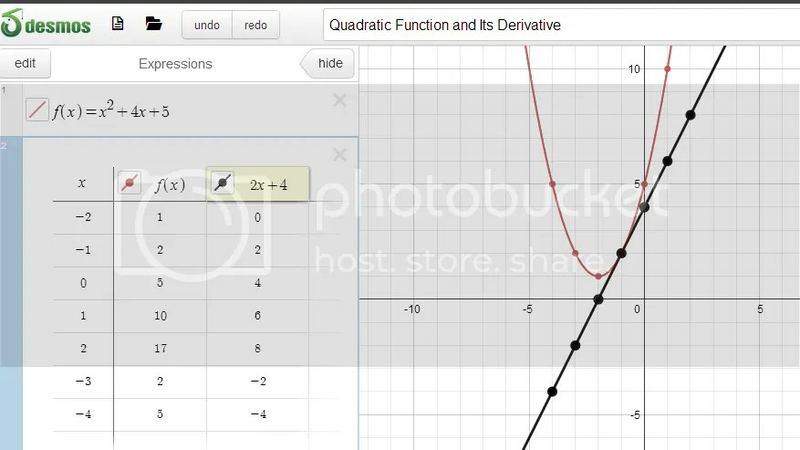 Play with the Desmos graph by clicking on the link, and enjoy the table feature. Sometimes it’s the simplest idea that produces the biggest wow moments, and the Daily Desmos site earns my kudos for not only its simple, powerful concept, but also its potential for differentiation. 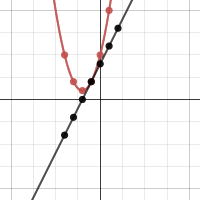 Each day, 2 new graphs generated on Desmos are given. It is up to you, or your students to determine how the graph was made. How was this graph made? Many of us teach high schoolers how to graph trig functions, and our students certainly know linear functions. So, how to combine them? The site also challenges users to contribute their own graphs and provides guidelines for basic and advanced graphs. What a fantastic tool for differentiation: allow you quick finishers to pursue a Desmos graph, and show off their ideas to the world. Print out the graphs, post them around your room, and let math go beyond the mundane and routine. When you have your first conversation about polar coordinates and functions with your class, when you weren;t planning to have it, you’ll know you are doing something right for your kids! Thanks to Michael Fenton for starting the Daily Desmos. Keep up the great work!